I am a London & Margate-based author, writer, creative consultant and artist. I write books, edit, take photographs and work as a creative disruptive consultant. I am also a highly-innovative digital content expert and copywriter for business, artists, charities and websites. 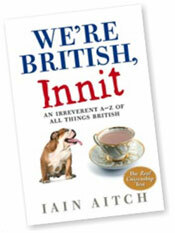 My second book, We're British, Innit, is out now in paperback - published by Collins. It is available from all good book shops and via Amazon. The book is a hilarious lexicon about Britishness and what it is that makes up the characteristics of Britain and the British. I have recently been artist and writer in residence in Margate, producing a photographic show about youth culture history for Turner Contemporary. I am now blogging about youth subcultures as well. You can read more about me on these pages and also keep up to date with recent work or just get in touch. From alcopops to X Factor via Churchill and Ovaltine, this lexicon of Britishness is an acutely observed A-Z of all that Brits are and do. Read what happened when I spent the summer travelling around England in search of summer madness.